People often think a car like the Toyota Prius sells itself. It sure didn’t feel like it. After 12 months, we emerged with a few claims to fame: sold the winning platform “Harmony between man, nature and machine,” launched Toyota’s first ever legit facebook page including four custom apps, and made headlines with some pretty cool installation art. This campaign brought “Harmony between man, nature and machine” to life in a city near you. Partnering with local sculptors Poetic Kinetics, we created a grove of 18-foot flowers that use solar panels to power outlets for charging up, and free wifi where users were encouraged to share their experience on facebook and twitter. This stunt got a lot of people talking (over 2 million hits on google) and the buzz has been incredibly positive, bringing attention to Prius’ solar technology and eco-friendliness. This facebook app encourages people to help make the world just a little bit brighter, one Random Act at a time. Rather than a run-of-the-mill discussion board, we engaged real Prius bloggers who already had loyal followings and elevated them to expert status on our page. We developed a tool where users can get credible 3rd party answers from these experts to anything they ever wanted to know about Prius, share, and discuss. Draw something and watch it come to life to help illustrate a cool feature about the Prius. 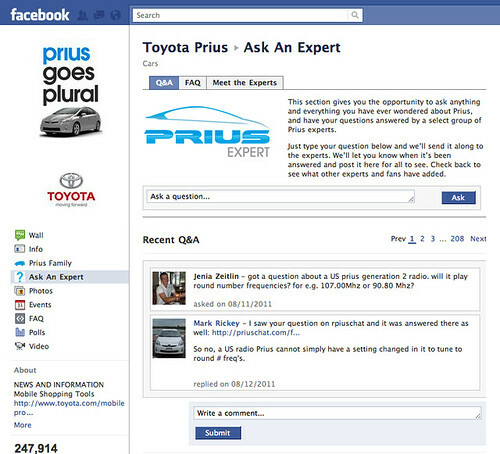 Toyota partnered with Discovery’s HowStuffWorks.com, a leader in search index relevance, in an effort to organically incorporate Prius into topics our target is googling. We developed an unbranded hub page called Fw:Thinking featuring creative polls, top 5 lists, and 100+ articles ranging from the science of happiness to surprising recyclables. In addition, we produced two promo pieces which aired on the Discovery Channel, discussing the science behind solar power and MPG — two of Prius’ key features.